Daniel's research into the Clava Thessara Infinitas suggests that the Ancient treasure may be found on P4M-328, and when SG-1 steps through the gate, they find themselves in a museum exhibit. In the lobby, many dignitaries have gathered for a party, and SG-1 attempts an inconspicuous departure, but while the stargate is genuine, the DHD is not, and dialing home is impossible. When the team's presence is accidentally discovered, the party guests panic, assuming the armed intruders to be religious rebels. Guards open fire, an alarm is triggered, and the building is sealed, leaving SG-1 the unwitting captors of dozens of terrified hostages. Among the hostages is Cicero, a museum researcher who believes SG-1's story of a portal for interplanetary travel, and he offers his cooperation. As Daniel maintains radio contact with Quartus, the Council's chief negotiator, Cicero escorts Mitchell and Vala through the museum. There they find among the exhibits a Goa'uld naquadah bomb which could provide the power source they need to manually dial the gate. Their attempt to steal it, however, is hampered by Jayem Seran, an over eager security guard who seizes his opportunity to become a hero. To compel Seran to cooperate, Vala activates the bomb, only to discover that it can't be turned off. 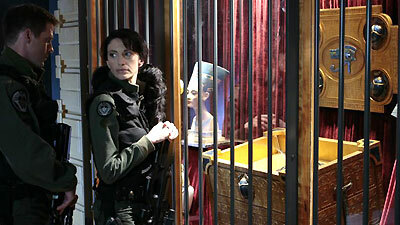 Manual dialing may deplete the bomb's energy, and with less than an hour before detonation, Vala connects its power source to the stargate and prepares to dial. However, Quartus has been ordered to end the standoff, and swarms of police officers retake the building. The gate activates, but the police prevent SG-1's escape. Despite his orders, Quartus is persuaded by reason, and he allows the team to pass through the event horizon. The nation will never know what transpired, however. In a world unready for alien visitors, the news will report that Jayem Seran is a hero, having single handedly foiled a rebel plot, saving the hostages and killing all rebels. Carter is in Washington briefing President Hayes. Daniel had believed that the Clava Thessara Infinitas was a hoax, but cross referencing Athena's research and our cartouche generated the gate address of P4M-328 as the possible location of the treasure. The point of origin for P4M-328 is glyph #33. Basic protocol states that when a civilization reaches a certain level of development, the SG teams don't make first contact in person, but instead send the MALP to make contact, and if the society is interested in the idea of extraterrestrial visitors, then an SG team will follow, not before. The stargate can be manually dialed using the naquadah core from a Goa'uld naquadah bomb, and doing so will establish a secure connection and deplete the bomb's power source so that it will not detonate. We got ourselves a bit of a John McClane here.